We’re thrilled to announce that Great British Chefs was named Website of the Year at the esteemed Good Web Guide Awards! Take a look at what the judges said, who we were up against and which of the other awards we won. 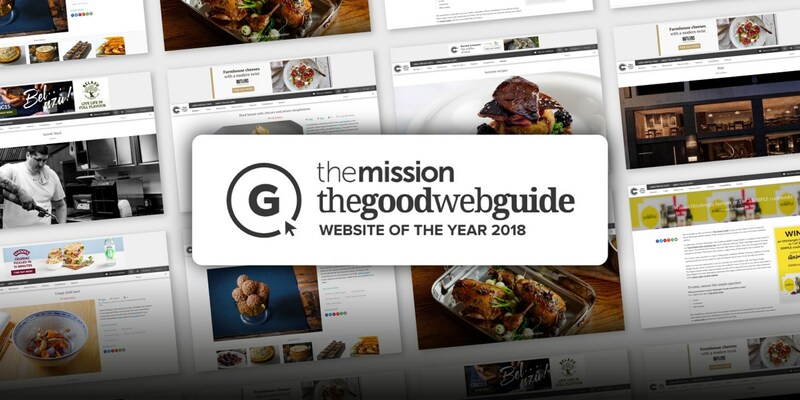 At an awards ceremony on 12 November 2018, we were thrilled to be named Website of the Year at Themission Good Web Guide Awards, as well as taking home awards for Best Use of Social Media and Best Food & Drink Website. The Good Web Guide (GWG) Awards recognise websites that showcase excellence in their field, covering everything from household brands to grassroots start-ups. Up against sites such as House & Garden and Sheerluxe, the judging panel named Great British Chefs as Website of the Year after looking at the quality of design, usability and content of all the shortlisted entries. Making up the judging panel were leading industry figures such as Holly Tucker, co-founder of Not On The High Street; serial entrepreneur Jerry Horwood and Kelly Eastwood of The London Chatter. In the past year we’ve been working hard to make our website faster, more responsive and easier to use as well as improving our search functionality and navigation, so we were over the moon to be recognised for all our hard work. Great British Chefs exists so that the 13.6 million foodies in the UK have a website where they can find truly great content, be that recipes, how-to guides or features. We’ve always seen aesthetics, design, imagery and video as an integral part of what we do, which is something the judges picked up on. 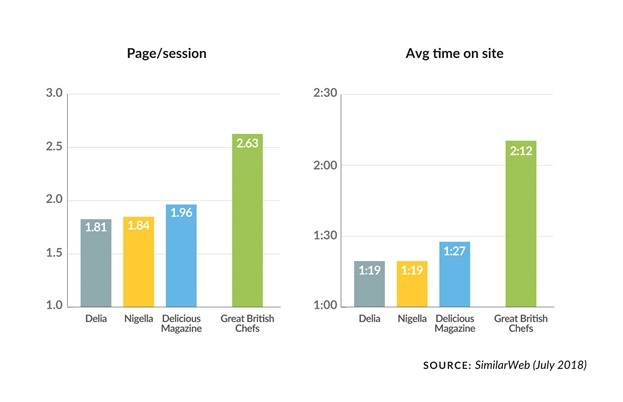 We’re now ahead of all our competitors when it comes to engagement, as you can see in the graphs below. Our recipes and articles are all about giving keen home cooks access to some of the highest quality and beautifully presented information on the web, which is why top brands such as Fever-Tree, Belazu, Cirio, Peter’s Yard and Tilda work with us to create everything from engaging content to events that get their message across in the right way. From exciting recipes showcasing the cuisine of East Africa for Schwartz to live-streamed cookschools hosted by Britain’s best chefs for Vitality, we make sure every brand campaign we work on is both bespoke for the client and interesting for the consumer. We also produce a lot of our own in-house content, which sees us champion the very best chefs of the UK and share their recipes, produce informative how-to cooking guides and seek out the most interesting food-related stories around the world. As you can tell, we’re all very proud of what we’ve achieved and how far Great British Chefs has come since it launched in 2010. Take a look at what the judges had to say about our website and the reasons why we won. 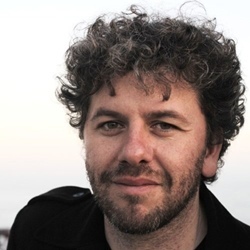 Themission judges were unanimous in their choice of recognising Great British Chefs as a remarkable achievement in website design, content and usability. It surfaces a volume of content in an intuitive and easy to use way, it works well across devices, uses impactful images and video while remaining fast and responsive throughout. Consistently presenting food in an interesting, aspirational and beautiful way is a hard task and Great British Chefs does it brilliantly. Great British Chefs is a brilliant website – it combines a large volume of easy to find information, combining recipes and content thematically and delighting users through usability and careful use of video, with rapid load speeds, performance and mobile optimisation. This website was an absolute pleasure to judge. The balance between content and imagery is spot on and very engaging. The structure, navigation, page layouts and general website architecture is very strong, not to mention the fantastic user experience across all devices tested. To top it off, the attention to detail – for example, how they've used knives for the mobile/tablet menus – really sets this website apart. It was a standout winner in the category. I love how Great British Chefs have used Instagram to show that cooking whilst special, doesn't have to be specialist. Really great mix of colours and makes cooking one of their dishes seem attainable. Great British Chefs is a site I find myself getting lost in for hours. It is informative, with clever and engaging editorial content and insight on the food industry.